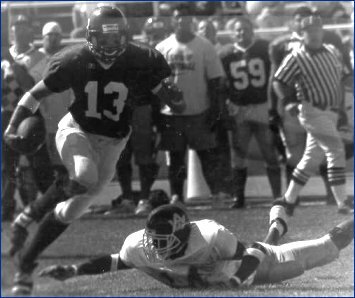 2000 (Sophomore): First-team All-America by the JC Gridwire at Snow College in Ephraim, Utah … Second-team All-America by the National Junior College Athletic Association … One of the nation’s top 75 juco prospects as chosen by SuperPrep … Caught 81 passes for 1,505 yards, an 18.6-yard average per catch, and 19 touchdowns … Most Valuable Player of the Dairy Bowl in Pocatello, Idaho. ... Coached by Jeff Kitts ... Picked UK over Brigham Young, Colorado, Kansas State, Iowa, NC State and Louisville. 1997-98: Fulfilled a two-year Mormon mission in Peru. 1996: Enrolled at Snow in the fall of 1996 and redshirted as a freshman quarterback before beginning his church mission.